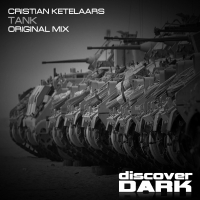 Returning to the label in style, Cristian Ketelaars delivers Tank - a full throttle excursion in heavy duty bass driven Tech Trance. Detuned off beat stabs join the party for the build which gives a stark insight into what is about to unfold. The breakdown is simple and gloriously effective with a distorted lead that cuts with a knife before dropping back into more audio carnage. Exactly what we love here at Discover Dark, delivered to prefection by this talented producer! 'Tank' is available now from Beatport and iTunes.